Atlas Soul is a—multiple award winning—band performing original music that celebrates poly-rhythm & melodies rooted in the Afro-Mediterranean traditions organically punched with deep funk, jazz and intelligent hip hop. Burning live performances with audience participation are their trademark! They have played scores of major venues such as The Montreal Jazz Festival, The Kennedy Center, The Festival International de Louisiane, the Boston Globe Jazz Festival, NYC’s Joe’s Pub, Montreal Festival Nuits d’Afrique and more. They regularly sell out shows in the Boston area and beyond. Atlas Soul features two outstanding lead vocalist, Regie Gibson an award winning poet, a percussionist and a natural power house performer and Jacques Pardo from France, a saxophonist, guitarist, composer and the band leader. Drummer extraordinary Zeke Martin and bassist Steve Davis “The groove master” hold the rhythm section along with Greek-American virtuoso guitarist Perry Bakalos. Atlas Soul sings in French, Italian, Arabic, Hebrew and English, making their performances truly cross-cultural music experiences. The lyrics speak of love, ecology, oppression, happiness, immigration, poverty, spicy food! The band has produced five CDs : Chamsa, Mabrouka, Maktoub, [email protected], and Gypsy Wind and two singles: We’re Atlas Soul and My Heart. 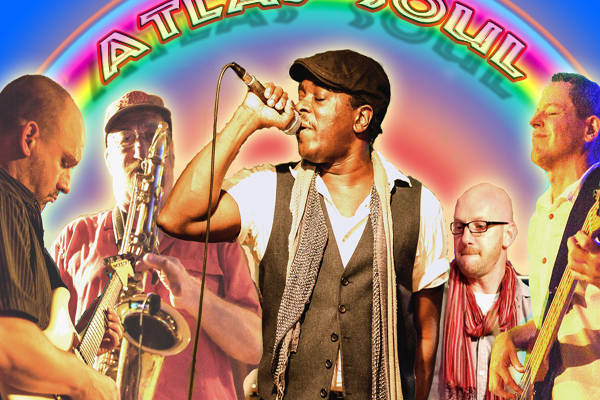 Atlas Soul’s motto, world music for world peace, spells out its philosophical and political goal: to inspire world peace through a fusion of music and culture that gets people to the dance floor.